The atmospheric drizzle of last Thursday evening turned into a fullscale torrent by Friday afternoon courtesy of Hurricane Alex. Not enough to stop intrepid adventurers from bravely exploring Austin’s downtown and venturing across Lady Bird Lake. Once on the other side, the rain hit full tilt and I ended up spending half an hour huddled under an overpass with some stranded joggers. Strangely, it was the most relaxed moment of the trip to date. There was nothing to do, no place to be except right there, watching the rain. 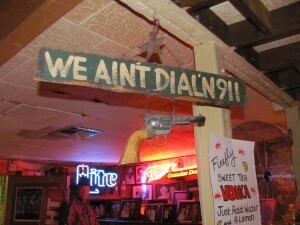 That evening, Circe and I headed to the Broken Spoke, one of Texas’ oldest, old-school honkytonks. Its the kind of place where the floor tilts and if you stand close enough to the dance floor, you can feel the vibrations of peoples’ feet hitting the boards coming up through the soles of your shoes. During one turn around the floor my partner asked where I was from, and when I replied “Washington, DC” he said, “The last time my people been up there, they was ridin’ with the Confederates. Ain’t been back since and don’t mean to go back.” I wasn’t sure if I was supposed to laugh or not but I did anyway. Today I dropped Circe off at the Denver airport and picked up my father. The Rockies beckoned. We drove to Estes Park and soaked up a few fleeting hours of sunshine. While hiking a trail called the Devil’s Backbone, we came across a chubby snake sprawled out in the middle of the path. We looked at each other, trying to assess its’ species and debating on whether to shoo it away or just try to get a running start and jump over it. After some very long seconds, the snake inched its way into the grass and away from us. As it slid by, we saw a two and a half inch rattle at the end of its’ tail. The sunshine and warm temperatures disappeared the second my father and I crossed the Wyoming border. It is 51 degrees here and threatening to drop even further. I’m not terribly afraid of snakes, but I’m not too keen on sleeping out the next several nights in the cold. I suppose it wouldn’t be true West if it didn’t give me a little kick from time to time.